Trec Vit. D3 + K2 (MK-7) is a combination of two synergically active vitamins, D3 and K2, in the form of comfortable soft capsules. The addition of MCT oil guarantees the optimal absorption of active substances. The synergy of activity of vitamins D3 and K2 is most often used in the prevention of osteoporosis and cardiovascular system diseases. However, due to the high incidence of vitamin D deficiency, supplementation is advised for practically everyone. The preparation should be considered particularly in autumn and winter, as that is when vitamin D levels in the organism reach its lowest value due to the lack of sun. Vitamin D3 (cholecalciferol) is a compound of the substance group referred to as vitamin D. The human organism produces vitamin D on its own when exposed to UVB rays. Its activity is similar to that of hormones. It participates in the processes of cells multiplication, regulates the functioning of the immune system, and affects the muscular system. The most important function of vitamin D3 is the regulation of calcium and phosphorus management, which makes it possible to create the right conditions for proper bone mineralisation. Vitamin K2 MK-7 is one of the forms of vitamin K2, considered to be highly bioavailable and the most assimilable. Its activity is concentrated mainly on calcium management. That detail is what makes it different from commonly known vitamin K, associated mainly with proper blood coagulation. Vitamin D3 is the main regulator of calcium and phosphorus management in the organism. It affects the genes of non-collagen proteins MGP (mainly osteocalcin and calbindin, which binds calcium), which determine calcium metabolism. The main task of those proteins is the uptake of the element and its inclusion in bone and tooth structures. That is possible only in the presence of vitamin K2, which stimulates MGPs and controls the functions they perform. The synergy of vitamin D3 and K2’s activity prevents the so-called calcium paradox. It happens when total calcium concentration in blood serum is right but its relocation in the organism is distorted. Without the right amount of vitamin D3 and K2, calcium, instead of being delivered to teeth and bones, can be deposited in soft tissues, organs, or joints, forming dangerous calcium deposits. The above-described cooperation between vitamins D3 and K2 in terms of calcium management is of utmost importance when it comes to maintaining proper skeletal system function. Supplementation with both vitamins can increase the durability of bones, enhance their mineralisation, and reduce the risk of developing osteoporosis. Moreover, vitamin D has an inhibitory effect on the synthesis of parathormone. It is responsible for the release of calcium from reserves deposited in the organism (that is mainly bones). Produced excessively, it contributes to bone decalcification and weakens the skeletal system. Large amounts of vitamin D receptors are located in osteoblasts. Their activation by vitamin D can result in an increased number of bone-forming cells, which has a positive effect on bone turnover and, consequently, increases bone durability. Including vitamin D3 and K2 supplementation in the diet brings many benefits for the health of the cardiovascular system. It is estimated that people with low vitamin D levels develop heart diseases more often than those without its deficiency. Moreover, they are particularly prone to left ventricular hypertrophy, which is highly dangerous for health. Vitamin D helps to regulate arterial blood pressure and prevent hypertension. It has a beneficial effect on the activity of the RAA (renin-angiotensin-aldosterone) axis, and promotes the normal functioning of smooth muscles and vascular endothelium. The activity of vitamin D3 is complemented by vitamin K2. It determines the transport of calcium to bones, thanks to which it prevents its deposition in other tissues. Increasing the supply of vitamin K2 reduces the risk of vascular calcification and arteriosclerosis. It also prevents the formation of atherosclerotic plaques, which are formed, among other things, out of calcium deposits. Vitamin D3 is playing a greater and greater role in the prevention and treatment of depression. Research shows that deficiencies of the vitamin significantly increase the risk of developing depression and other mental disorders. Scientists suggest that in many cases, supplementation with large doses of vitamin D3 can result in similar effects to those achieved with standard antidepressant drugs. Vitamin D3 deficiency is correlated with the frequency of infections and colds. It can also increase the risk of developing autoimmune diseases. Vitamin D3 has immunomodulatory properties and inhibits excessive reactivity of the immune system. It helps to reduce chronic inflammation by balancing pro- and anti-inflammatory cytokines in the organism. Vitamin D3 deficiency has a negative effect on the activity of T lymphocytes, which play a crucial role in the immune system. Moreover, vitamin D3 stimulates the production of cathelicidin. It is a protective protein, which works as a natural antibiotic in the human organism. To sum up, Trec Vit. 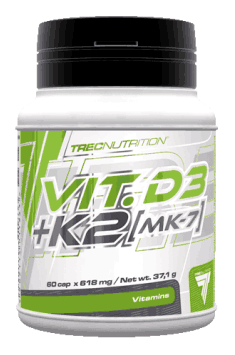 D3 + K2 (MK-7) is a perfect way to supplement two crucial vitamins. The synergy of their activity brings many benefits, particularly in terms of preventing osteoporosis and cardiovascular system diseases. The supplement is particularly recommended for people complaining of problems with the skeletal system, are prone to diseases, or suffer from low mood.